Citation Information: J Clin Invest. 2011;121(7):2662-2667. https://doi.org/10.1172/JCI43639. 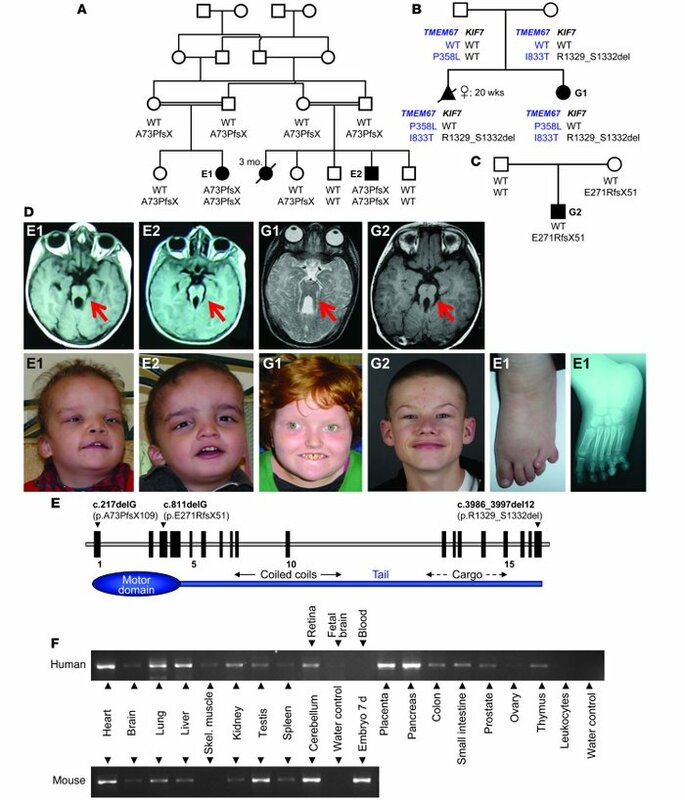 KIF7 mutations cause Joubert syndrome and define a novel disease locus, JBTS12. For clarity, the one-letter code was applied for mutation designation. (A–C) Pedigrees of JBTS families with KIF7 mutations. (A) Egyptian index family. Linkage analysis in this family identified the 15q locus harboring KIF7. (B) G1 family. Abortion was induced in the first pregnancy because of an encephalocele. (C) G2 family. (D) Top: Axial brain MRIs showing molar tooth sign (red arrow) from the affected members of each family. Bottom: Dysmorphic features characteristic of JBTS (pronounced in E1 and E2, with hexadactyly in E1 and hypertelorism in G1). No dysmorphism in G2. (E) KIF7 gene structure (drawn to scale), mutations, and protein illustration. (F) Expression profile of human and mouse KIF7 (RT-PCR).